I love my laptop. Sure, I spend half my time swearing at it, as random beeps emit and the screen scarily goes blank; but when all is said and done it is my beloved friend, my portal to the web and my entry into the endless blogs that drip away my time with their sweet musings, lomo-like photos and sarcastic outpourings. I’d be lost without it, as no matter how great my iPhone/ Xperia Mini are, the full screen browsing experience can’t be replicated. Why not shower your laptop with some love- doesn’t it deserve some accessories? 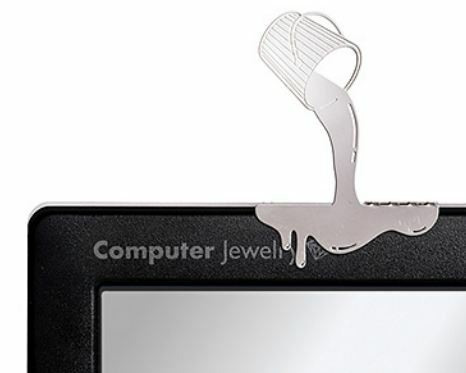 I stumbled across Computer Jewelry* the other day, and I’m a big fan. 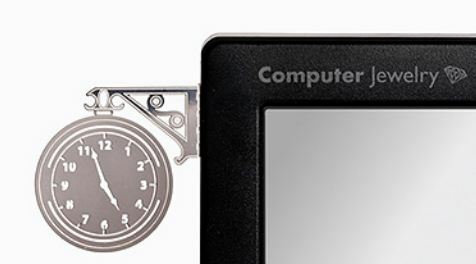 Basically, they’re pieces of polished alloy, designed to stick via an adhesive pad to your computer. Whether you opt for a clock on the side, or a bucket spilling water over the screen (the ultimate IRL horror), there’s probably something you’ll like.